I’ve had a ruddy busy few weeks recently, hence the lack of a post last week, but hopefully this bumper-sized blog-a-rama will feed your appetites sufficiently! Last weekend I had two Elite Nationals in a row (Bousquet and Guegon) and then the weekend just gone I rode le Tour de l’Artois Coupe de France stage race. If I were a man of few words I could summarise all of these athletic outings in a single word – suffering – but luckily (?) for you all I’m a bumbling windbag. First up was Bousquet, and it was a lovely day for a bit of tannage, and chatting with bike-fwends in the bunch. Unfortunately some people wanted to race, so we had to fit some of that in too. I covered attacks for the team early on but nothing meaningful really stuck until the finishing circuits, which included a just-that-bit-too-long finishing climb. I had been feeling pretty un-good throughout and doing my standard bottle miss meant that I’d resorted to ducking behind other riders as they drank to try and get some residual liquid spray inside me. I also started licking my arms to try and replace some salts, looking a bit like that weird monkey at the zoo who’s a bit too interested in his bodily functions. All good clean fun of course! I came good for about 10km, got my teammate Fabian into the front group and blew my nut on the climb, to crawl home at the back of the bunch. Sunday at Guegon was a pretty similar affair, although I’m struggling to remember ‘coming good’ at any point. A split went after a mere 15k in some hideous crosswind section dirty enough to merit my having nightmares about it for a few nights; and I’m meant to be good at riding in the wind! Unfortunately for me I was near the front end and thus had to pull the group back, more or less on my own, whilst rival teams sat smugly behind. Of course when it did return, I was feeling beyond fantastic and the break of the race went over the top. That was my race over from then, really. 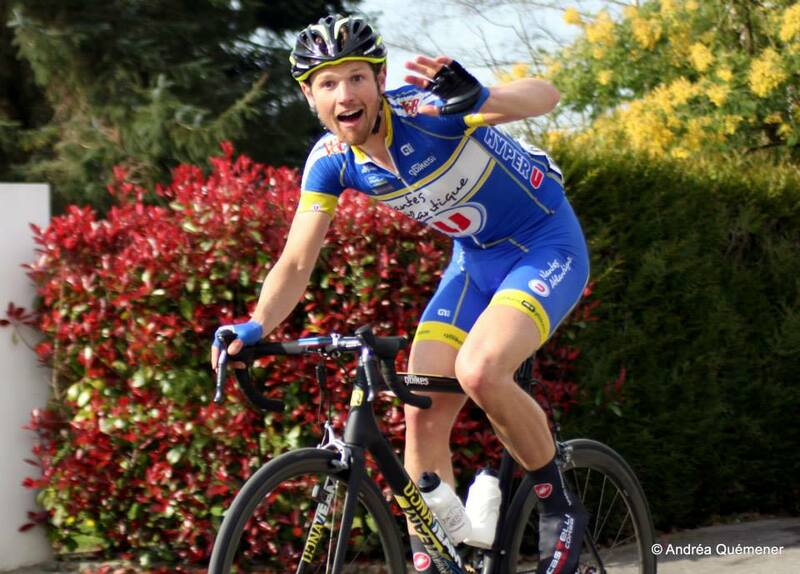 Boucles de l’Artois began with a 23km prologue, and to say I was excited would have been an understatement. I was positively pumped for it to begin and even more so once we’d recon-ed the course as it was rolling, dead roads with exposed windy sections. It was perfect for me and I was totally ready to take my chance and take that jersey early doors. I felt incredible during my warm-up. I felt outstanding during my ride. I finished more fatigued than I’ve ever been after a time trial. I had given everything. Everything was not enough. I came 16th, and I was 53 seconds down on the winner. That is what heartbreak feels like. I’ve thought over my ride many times since and I honestly believe I did the best ride I’ve ever done, and that I could have done. It is hard for me to swallow because (without sounding dreadfully headstrong) I am good at time trials and I can’t understand how I didn’t win. Anyway it’s cool, I’m over it (I’m SO not over it). The afternoon stage was a sufferfest and I actually sobbed joyfully onto a teammate’s shoulder when the break went away because it meant that the pace, mercifully, slowed. When the break came back on the final lap I dragged my sorry beehive up to the front and did team duties for the boys, elbowing, leaning on people and generally intimidating my way to the front with them on my wheel. As a team we are well respected as winners now so we get given a bit more road space, but in the final of a Coupe de France race it’s still an absolute scrum irrespectively. I blew my nut on the final kicker climb with 5km to go (the beast who had already ejected me out the back of the bunch twice prior) and then it was down to Lorenzo and Fabian who, between them, got a 1-2 respectively. It was an awesome result to come away with! Following team orders on the final circuits I got on the front to chase down a dangerous breakaway with 20k to go, as we had no one in it. I truly emptied myself, as one only can on the final day of a stage race, 150k into a 170k stage, and dragged back the group. What I didn’t know, as I didn’t look behind (and could not really see anymore at this point), is that I split the peloton with most of my team on the wrong side of it. I had been trying to work for the team but in effect I’d screwed us all, not least myself. I completely exploded with 7k to go and was caught and passed by what was left of the bunch. I could barely pedal. I’m having a few days off now, yessireee. Until next time friends, take care all!